How can legacy logic fragmented and duplicated for different delivery channels be centrally consolidated? Legacy systems custom-built for specific delivery channels (mobile phone, desktop, kiosk, etc.) result in redundancy and application silos when multiple channels need to be supported, thereby making these systems burdensome to govern and difficult to federate. An intermediary service is designed to encapsulate channelspecific legacy systems and expose a single standardized contract for multiple channel-specific consumers. The service established by this pattern will require significant processing and workflow logic to support multiple channels while also coordinating interaction with multiple backend legacy systems. The endpoint processing logic established by this pattern often introduces the need for infrastructure upgrades and orchestration-capable middleware and may turn into a performance bottleneck. 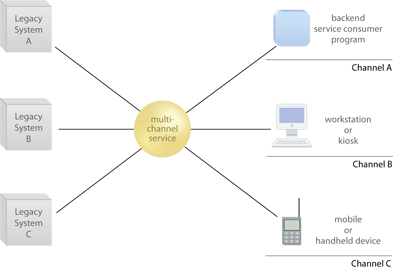 The multi-channel service acts as the central contact point for different channel-based solutions (right) and legacy systems (left).